from route 101 in Temple turn onto route 45 South. Follow route 45 for 1.7 miles to the center of Temple then turn right on West road. Follow West road for 3.1 miles then turn right onto Temple road. Follow temple road for 0.4 miles then bear right at the Y. A gravel parking area is 100 feet on the left with availability for 4-5 cars and marked with a trail information kiosk. From the Wapack trail parking area on Temple Road follow the Wapack Trail North marked with yellow triangles. The Wapack Trail is well defined and begins a relatively rocky, rooty and moderate ascent soon reaching a trail kiosk with map and wooden sign marking the next 2.2 miles of trail as the Cabot Skyline dedicated to Thomas Cabot. The wood pile remains of a farm building stand to your right as you cross a stone wall which runs along your right parallel to the trail. At 0.3 miles you reach the Roger Myrick Outlook with views of Kidder Mountain to the east. From here the grade becomes easy to moderate climbing small slabs as you continue north. The trail offers several viewpoints along the way which become increasingly better as you progress. The intersection with the Berry Pasture trail marks the 1.1 mile halfway point. A short 0.15 miles north is the 2010 foot Burton peak which provides the first views of Mt. Monadnock to your west. The peak is signed and highest point appears to be a large flat rock standing 4-5 feet out of the nearby rock wall. I found no official markings at the highpoint. Continue north on the Wapack Trail as it breaks away from then returns to the rock wall several times along your journey north. At 1.5 miles you reach another outlook providing good views to the north east and at 2.0 miles you get your first view of Holt Peak directly to the north. The incline increases grade over rocky terrain the final 0.2 miles to the Holt Peak summit. There is a sign at the summit however the highest point and actual summit is a 100 foot spur trail away. Return the way you came. The 21 mile Wapack Trail begins in Ashburnham, Mass Climbing Mt. Watatic and continues over North Pack Monadnock to it's northern terminus on Mountain Road is Greenfield NH. 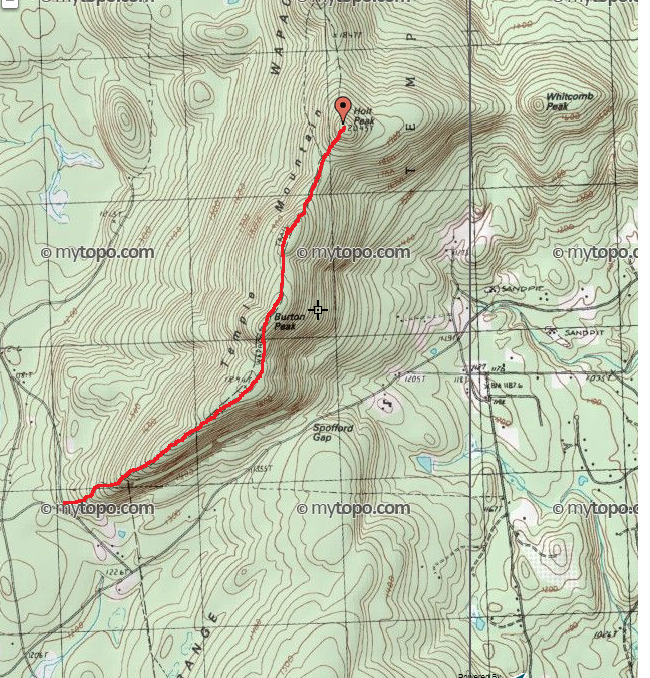 The Wapack Trail is one of the oldest trails in the northeast and passes along the summits of Watatic Mountain, Pratt Mountain, New Ipswich Mountain, Barrett Mountain and temple Mountain before ascending the Pack Monadnock Mountains. The trail is marked with yellow triangles and large stone cairns on it's stony sections and ledges. The "Cabot Skyline" is a 2.2 mile section of trail dedicated to Thomas Cabot who was a primary land donor to create a trail easement gaining access to these summits. in 1964 Mr. and Mrs. Cabot of Weston, Ma. donated 176 acres of land including the crest of temple Moutain to the New England Forestry Foundation. This section of trail is arguably the best section of the entire Wapack Trail traversing rocky ledges and providing several outlooks on the way to it's destination of Holt Peak. I found minimal information about the Roger Myrick Outlook. During my research I learned the group who preserves and maintains the trail is named "The Friends of the Wapack". Bruce Myrick is Treasurer of that organization and I can only assume that Roger is related in some manner. As I commenced this hike a significant rock wall seemed to always parallel the Wapack trail. I suspect this was or is the boundary line between the towns of Sharon and Temple.